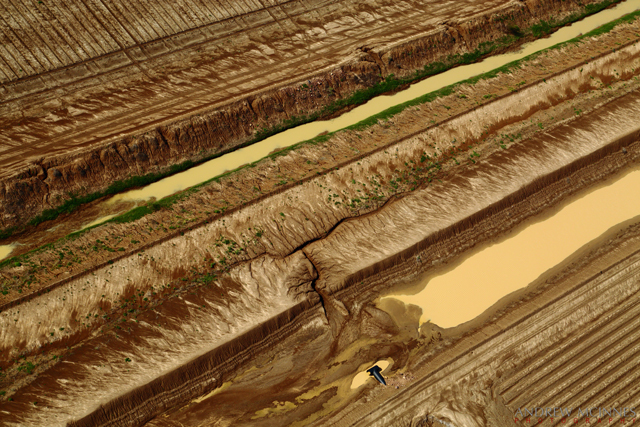 Aerials of Windang and the mouth of Lake Illawarra – NSW. Aerial images of Windang and the mouth of Lake Illawarra, NSW. Belmore Falls – Southern Highlands, NSW. The impressive Belmore Falls, in good flow. These falls are in Morton National Park, very near the town of Robertson in the Southern Highlands region of NSW. The Belmore Falls is a plunge waterfall with three drops on the Barrengarry Creek in the Southern Highlands and Illawarra regions of New South Wales. Posting #9 of my road trip from Fremantle to Kununurra, Western Australia. 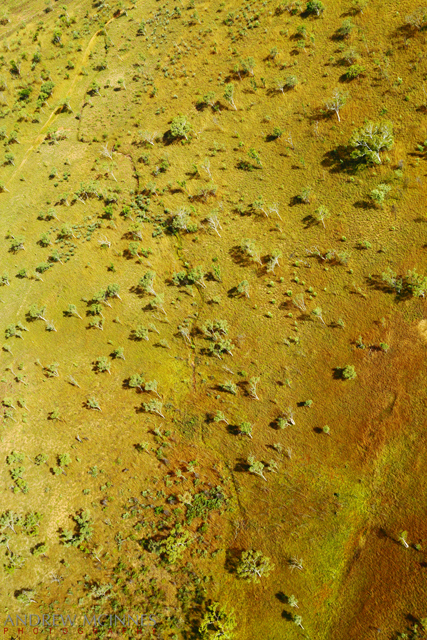 Other than the first two images, this post contains only aerial views of the Kununurra area, captured from a Robinson R22 helicopter owned and operated by Top End Mustering. 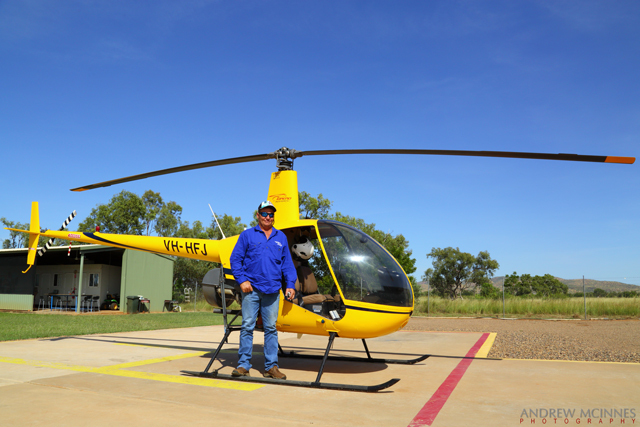 This is the helicopter for the trip, and the pilot – Ty Rankin (of Top End Mustering). Helicopter and Pilot 2AM-003668. © 2014 Andrew McInnes. 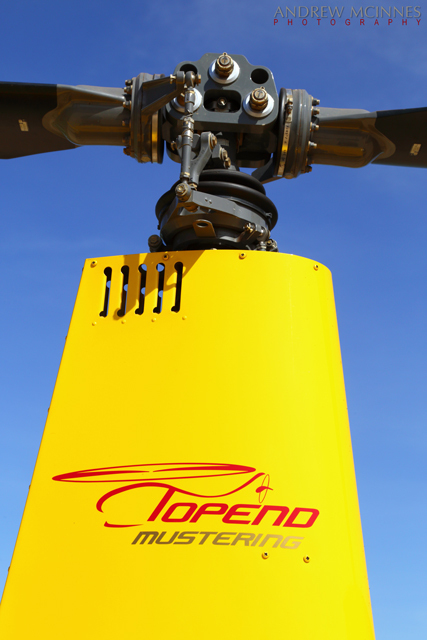 Helicopter 2AM-003669. © 2014 Andrew McInnes. 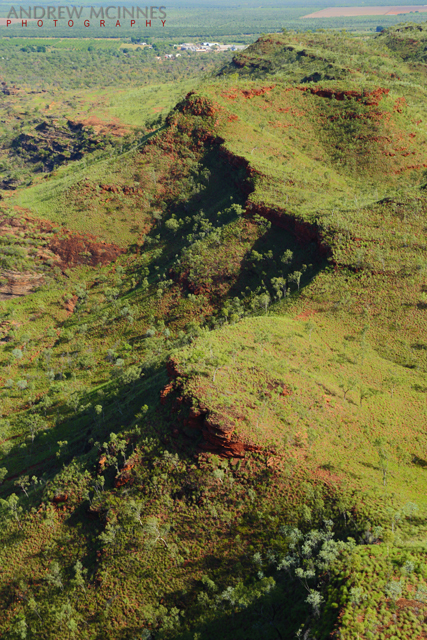 The Kimberley savannah and a portion of the lower Ord River – Ivanhoe Station. 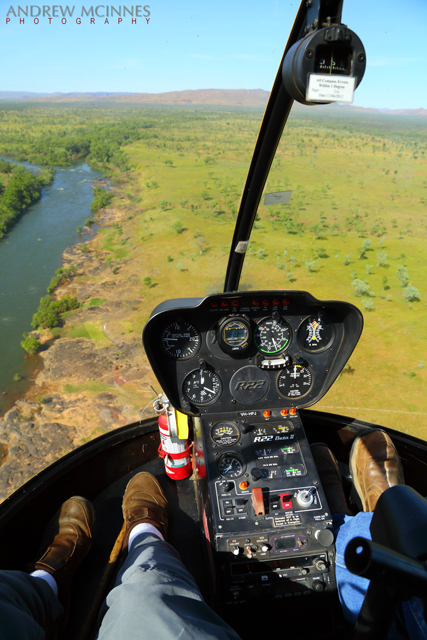 Helicopter-and-Ord-River-2AM-003625. © 2014 Andrew McInnes. 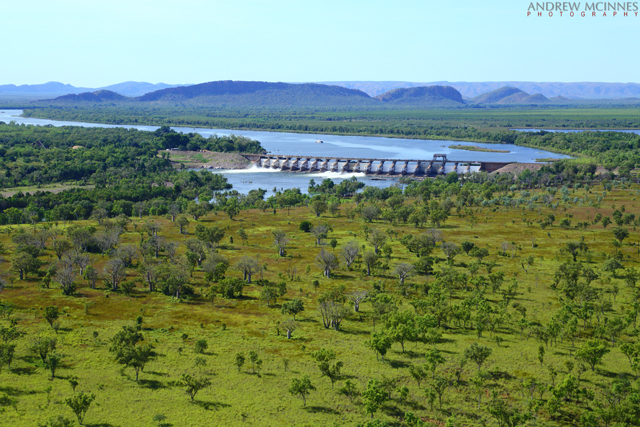 Below the dam of Lake Argyle, the Ord River Diversion Dam holds back Lake Kununurra, which gravity feeds the Ord River Irrigation Area with water via the Main Channel. The Victoria Highway crosses the river here. Ord River Diversion Dam 2AM-003654. © 2014 Andrew McInnes. 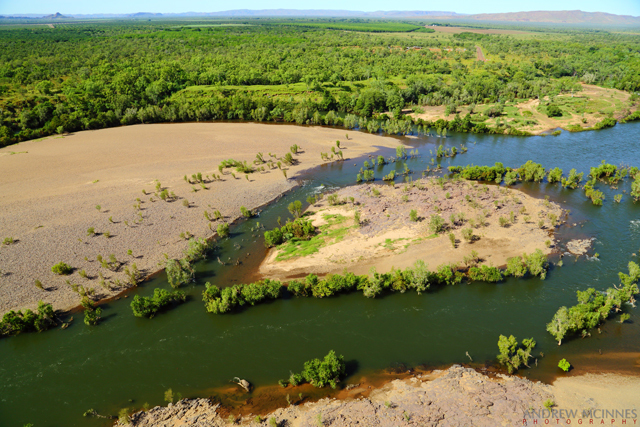 Downstream of the Ord River Diversion Dam; the lowest reaches of Lake Kununurra meander to the upper left of the image, then beyond. 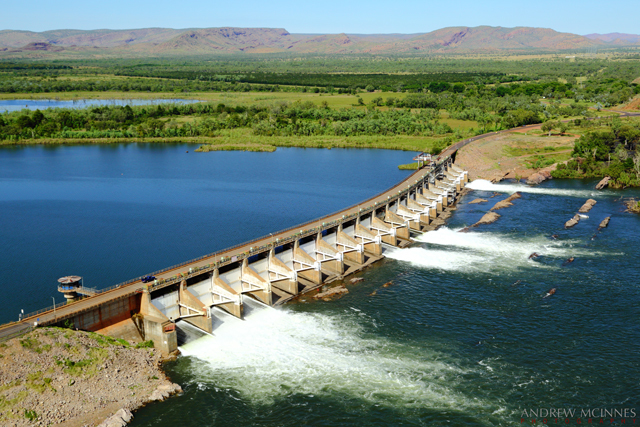 Ord River Diversion Dam 2AM-003638. © 2014 Andrew McInnes. River flow below the Diversion Dam. Ord River 2AM-003616. © 2014 Andrew McInnes. 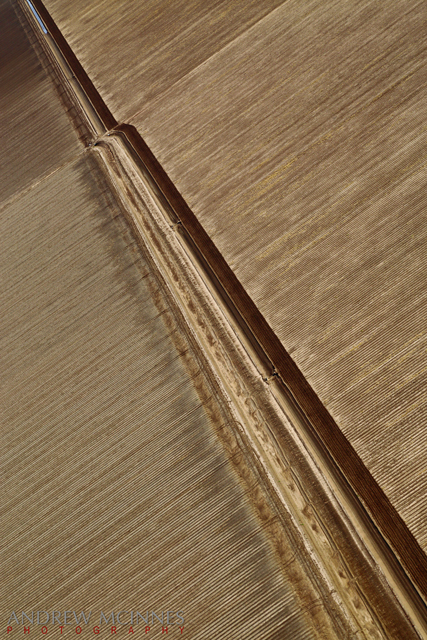 These next few images capture some of the irrigation ditches and the agriculture that depends on them. Ord River Irrigation Area 2AM-003541. © 2014 Andrew McInnes. 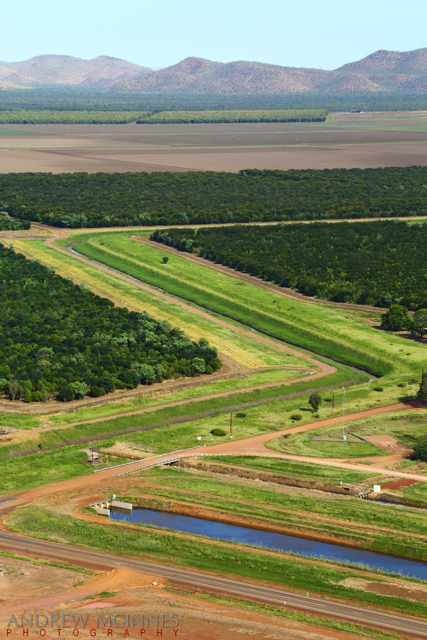 Ord River Irrigation Area 2AM-003567. © 2014 Andrew McInnes. Though a variety of crops are present (and others tried previously), these are Indian Sandalwood. Ord River Irrigation Area 2AM-003555. © 2014 Andrew McInnes. Ord River Irrigation Area 2AM-003554. © 2014 Andrew McInnes. 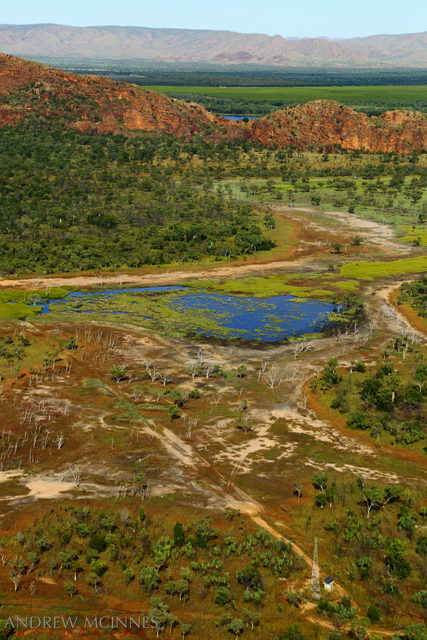 Great cattle stations abound in the Kimberley, and this savannah, like those throughout the world, look resplendent after the rains. Kimberley Savanna 2AM-003535. © 2014 Andrew McInnes. Kimberley Savanna 2AM-003528. © 2014 Andrew McInnes. 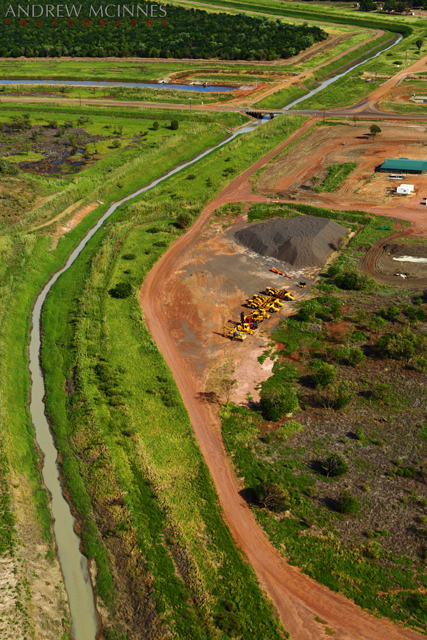 Kununurra 2AM-003604. © 2014 Andrew McInnes. 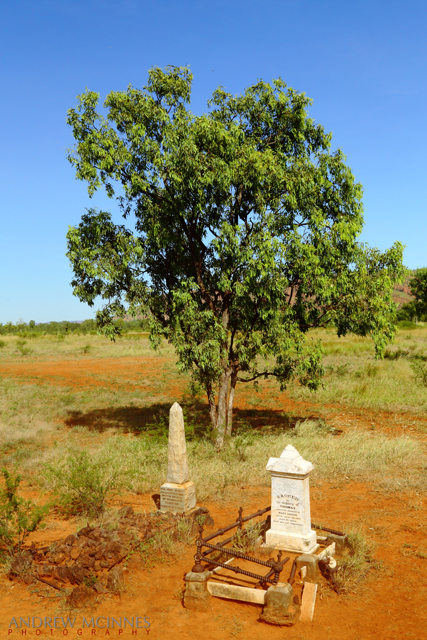 A pair of graves on a station near Kununurra – DEACON, Thomas, died 28.6.1905 (age 49) & DURACK Neil Joseph, died 28.11.1920 (drowned, age 30). Gravestones – Ivanhoe Station 2AM-003608. © 2014 Andrew McInnes. Bordering the irrigation area are numerous ranges such as this. 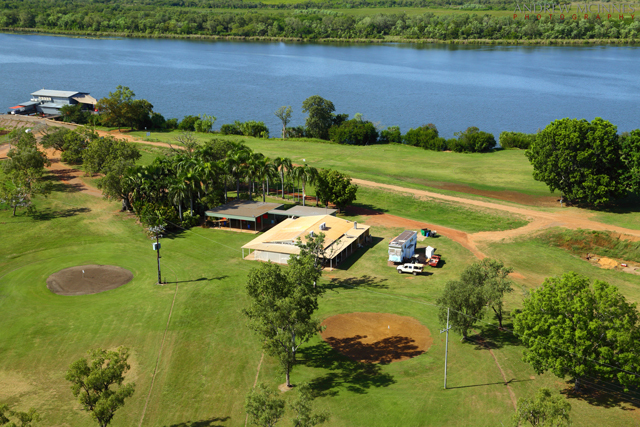 Kununurra 2AM-003530. © 2014 Andrew McInnes. 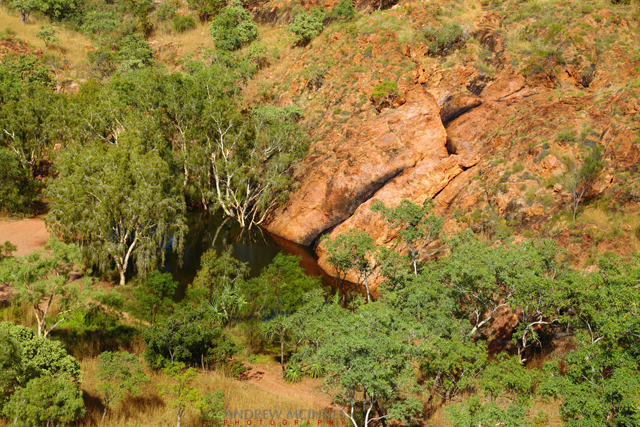 Edging and among the ranges there are numerous waterholes such as this, many with waterfalls (during/after the wet). 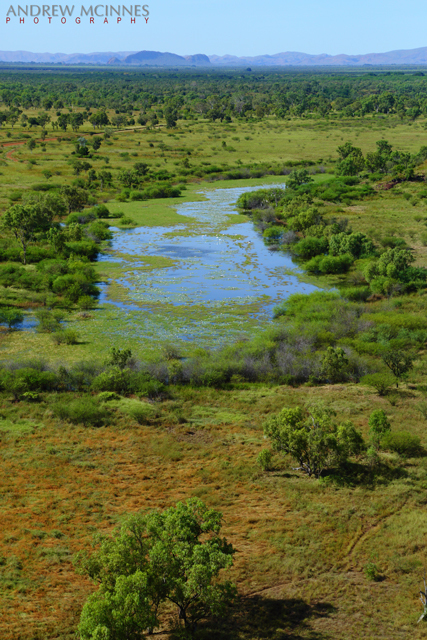 Kununurra 2AM-003597. © 2014 Andrew McInnes. Back to the immediate vicinity of Kununurra: This is “Sleeping Buddha”/Elephant Rock on the edge of Lake Kununurra. Sleeping Buddha 2AM-003512. © 2014 Andrew McInnes. Sleeping Buddha floodplain 2AM-003517. © 2014 Andrew McInnes. 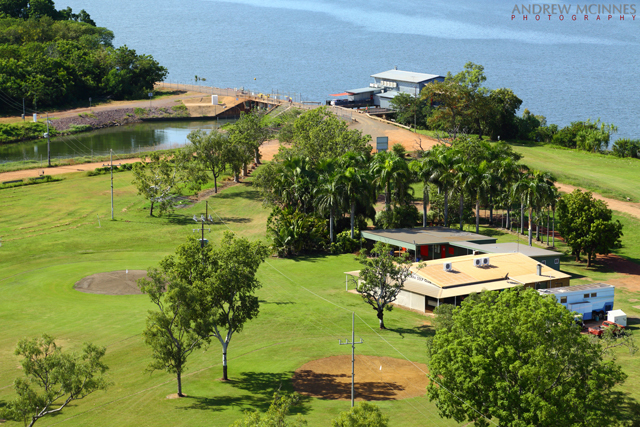 Two views of Lake Kununurra Golf Club – one of the hosts for famed the Ord Valley Muster. Lake Kununurra Golf Club 2AM-003662. © 2014 Andrew McInnes. Lake Kununurra Golf Club 2AM-003664. © 2014 Andrew McInnes. 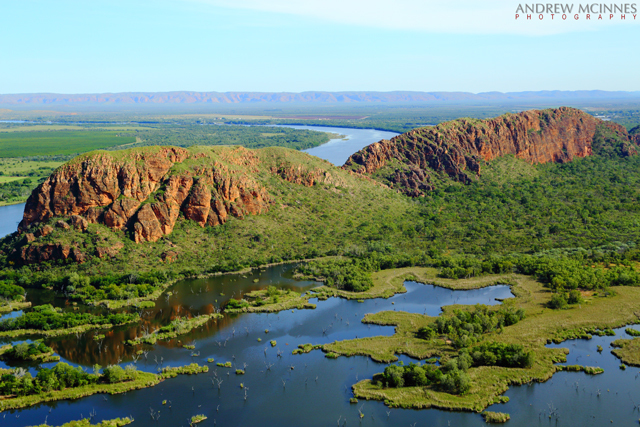 The next post will feature Lake Kununurra – I hope you enjoyed this post.